Have you ever had a moment that made you stop and ponder about things? I just had one recently. 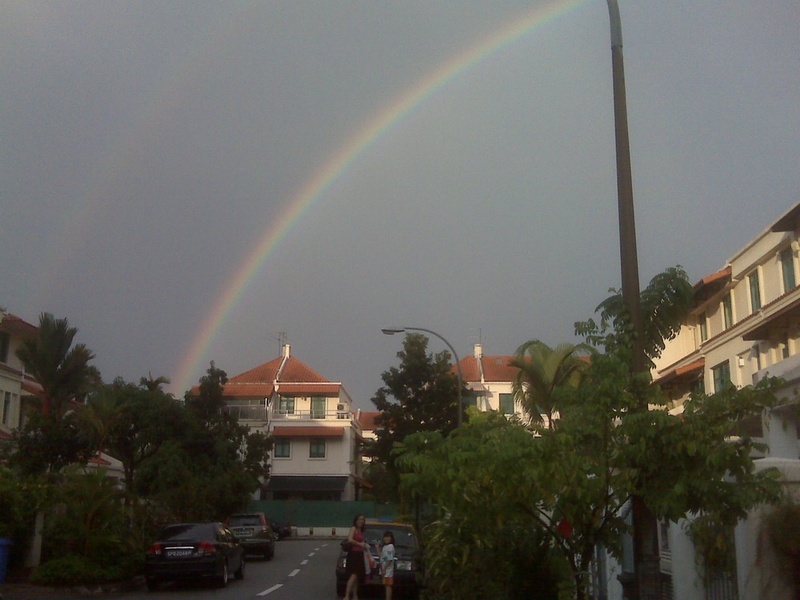 Was returning home one day and there it was... the biggest rainbow I have ever seen in my life! I have seen some in the past but nothing close to this. The colours were so clear. Every single one of them. Really tanda kebesaran Allah. I took a handphone photo but it was really bigger & closer than what you see here.... Sorry lah macam orang jakun, but honestly you don't get this kind of encounter unless it was meant for you to see it. My wife, kids and I stared at it for a whole 15 minutes and I took that chance to explain to my kids how rainbows were formed. They were thrilled! But this sighting got me thinking of Allah's other great creations and you can't help but to reflect what you have done to appreciate them. When I went back to office the next day I started staring at things our company have done and things we would like to get into. Somehow, there's a bigger purpose to everything... I began to cut "fats", trim the team and spend time realigning things. It was great to ponder and steer things to a greater good. At home, this sighting encouraged me to explain to my kids every little thing or kejadian. Do share with me your enlightening moment.